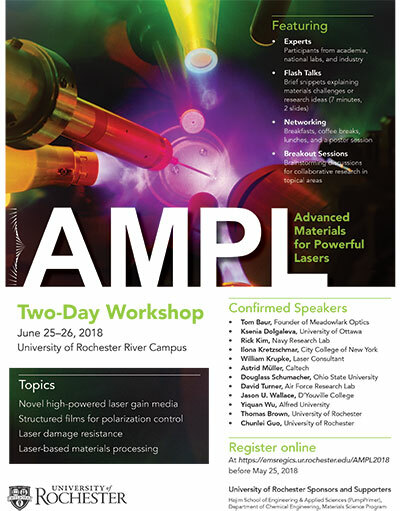 A workshop will be held on June 25-26 in Wegmans Hall to inaugurate Advanced Materials for Powerful Lasers (AMPL). The workshop will features participants from academia, industry, and national labs who will discuss novel laser gain media, structured films for polarization control, laser damage resistance, and laser-based materials processing. Attendees must register online before May, 25, 2018. Sponsored by the Hajim School of Engineering and Applied Sciences (PumpPrimer), the Department of Chemical Engineering, and the Materials Science Program.